A £250,000 appeal has been launched to secure the most advanced surgical robot of its kind for Sheffield. Sheffield charity Neurocare has worked with French-based manufacturer Medtech to bring this state-of-the-art health technology to the city’s Royal Hallamshire which is now the only NHS hospital in the UK to have a ROSA. Sheffield consultant neurosurgeon Mr Dev Bhattacharyya said: “We are delighted to be the first NHS hospital in the UK to offer patients world-class robotic neurosurgery. “I’ve been a neurosurgeon for 17 years and it is amazing to see how accurate the robot it is. But to keep the ROSA in Sheffield, Neurocare needs to raise £250,000 in six months. The charity, which buys the latest equipment and supports groundbreaking neurological research at Sheffield Teaching Hospitals NHS Foundation Trust, has now launched a major fund raising appeal. Neurocare Chair Beverley Webster said: “We are excited and very proud to be able to bring the first ROSA Robot to an NHS hospital in the UK. “Because of its reputation Sheffield has attracted highly specialized neurosurgeons who, using this amazing technology, can change the lives of many more people. 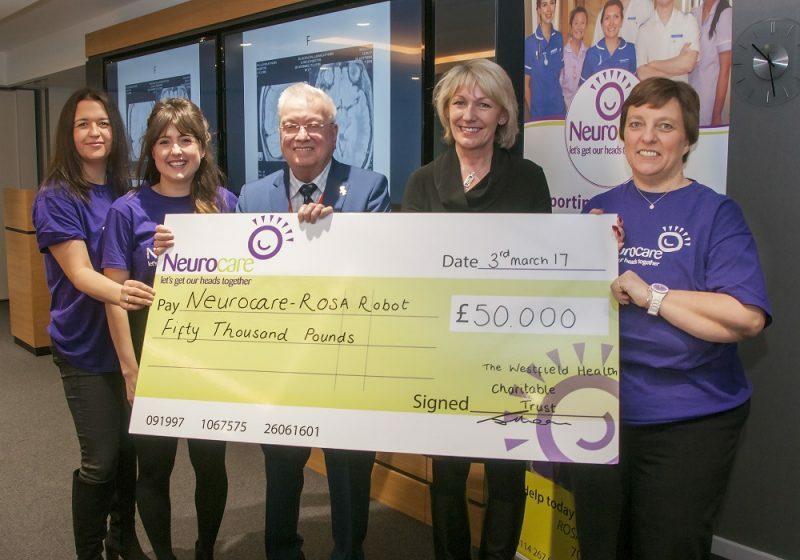 The ROSA Robot Appeal got off to a great start this week with a £50,000 donation from Sheffield-based health insurer Westfield Health. Using an advanced computer system, ROSA allows neurosurgeons to create precise 3D maps of a patient’s brain so they can plan the best route for surgery, guiding the robot’s arm and instruments to the exact location of the seizure, tumour or biopsy. ROSA’s pinpoint precision is far less invasive and has the potential to reduce surgery times by as much as 40 per cent, greatly improving recovery and surgical outcomes. The robotic arm mimics the movement of the human arm and can use instruments as thin as a needle. Mr Bhattacharyya, who received special robotic neurosurgery training in France and the United States, added: “We are moving increasingly towards minimally invasive medical interventions. Robotics, GPS-like systems and error correction algorithms allow us to perform more complex procedures with less risk. “Robotic surgery eliminates mechanistic errors and achieves sub-millimetre accuracy every time as well as taking a lot less time to perform the surgery. “Previously UK patients would have had to travel privately to London or abroad to have robotic neurosurgery, so we are enormously grateful to Neurocare for bringing this first-class equipment to Sheffield and the NHS. To find out more about the Appeal go to www.neurocare.org.uk. To donate please go Neurocare’s JustGiving page //www.justgiving.com/campaigns/charity/neurocare/rosarobot or you can make a text donation by texting ROSA16 and how much you want to donate to 70070.